It's great for people who are afraid of heights because you are confined to a wind tunnel and there's no danger of crashing to the ground! Love the pictures, omg that chicken karaage looks delish! I love how the coat looks on you!! So sad I haven't gone ice skating yet this year!! it's so fun! and DIMSUM is my FAAAVE! Haha, yes but only for a little bit because I would miss the food too much! Great photos! I love those glasses! I really like the chain print - is that a scarf? One is a blouse and the other is a dress! Sometimes I feel like all I instagram is food! LOL. It's the most addicting app ever, I just wanna whip out my phone and take a picture of everything (which happens to include every one of me meals...). My Instagram is 90% food... it's SO BAD. People know they can't start eating until I take photos, haha! Your Mackage coat is so pretty. I'd never heard of it until a friend who just LOVED the label bought one of their coats a few years ago and the quality was just so great. Agh, that's the reason I can't drink white wine or beer. Soju is not my fave but I like mixing regular and lemon soju together on occasion. Love these shots, instagram is the best! I like that first picture mainly because I lurrrveee that coat! love the chain print- so gorgeous! Love all these pics! You look so stunning in those first two! And yes to the Starbucks cup, they always cheer me up. Adorable! I love the "Life is short, Eat Desserts First!" haha. I'm obsessed with instagram! Thankfully no though it is quite the workout! I must say, I love your glasses! They look great on you! I love how instagram captures and transforms a moment! Those starbucks cups were really cool. 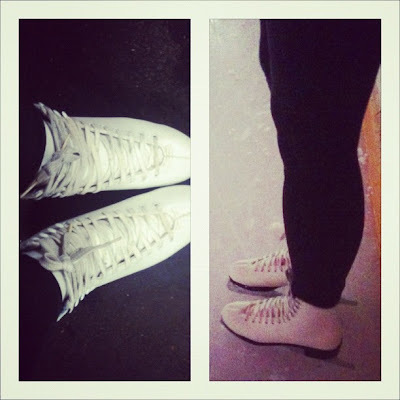 Love the ice skates. I never learned, but enjoy ice skating. And those sunny side up eggs, bacon and toast look delish. Love the chain print scarf. Very glamorous.